Now we are down to what might be called the "specialty" animals. Or perhaps, in another context, I might call them the "cats and dogs." 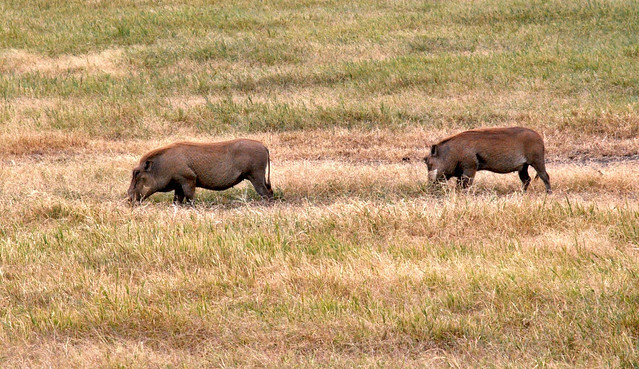 First up are the Warthogs. 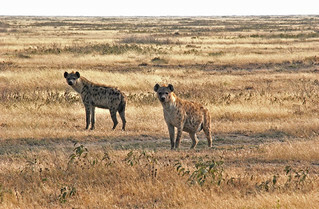 We saw several Hyenas. 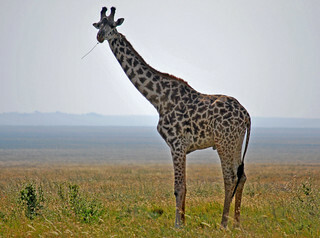 They are notable for the long and strong necks used to carry their prey. This pair is watching closely as we take pictures of the baby in their den. Who is the baby looking at? 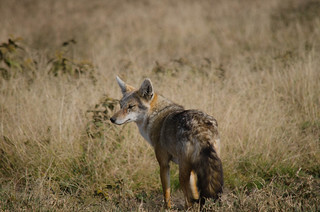 This Jackal passed briefly by our vehicle. Fortunately, Melissa later got a great picture. 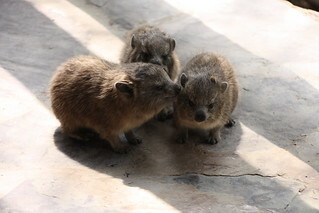 At one of our lunch stops in the Serengeti, there were a few Hyrax hanging around. I only got a picture of one, but Melissa snapped three together. 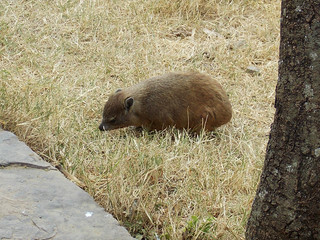 They look like a rodent but are related to the Elephant according to this Wikipedia entry. 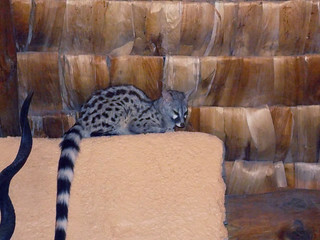 This Genet borders on being a pet. 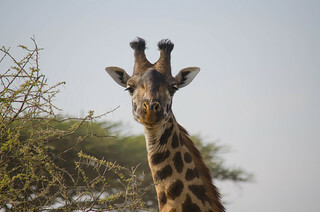 It is one of several to be found roaming around the rafters at the Ndutu Safari Lodge. 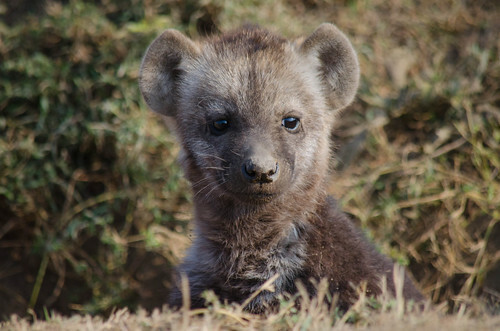 The Wikipedia entry says they are related to cats but related more closely to the mongoose. 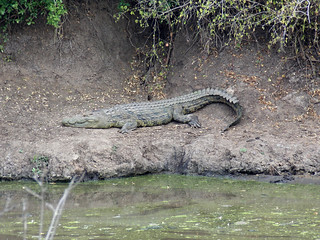 We saw a few reptiles and amphibians too. They ranged from small to large. 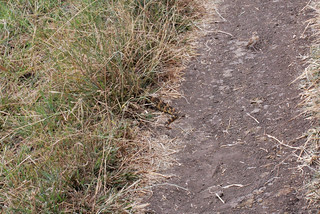 Our driver spotted this snake's tail alongside the road as we headed up a hill. This species is responsible for more fatalities than any other African snake. 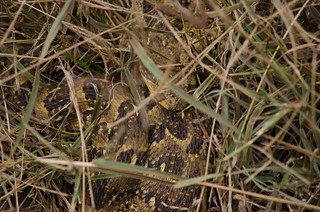 This is due to a combination of factors, including its wide distribution, common occurrence, large size, potent venom that is produced in large amounts, long fangs, their habit of basking by footpaths and sitting quietly when approached. And finally, we have the animal bookends. 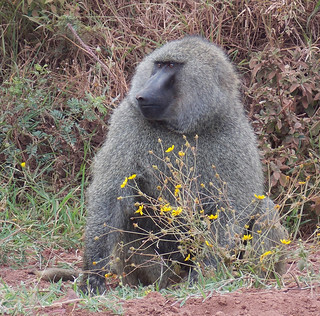 The first animal we saw just after we entered the Ngorongoro Conservation was the baboon on the left. 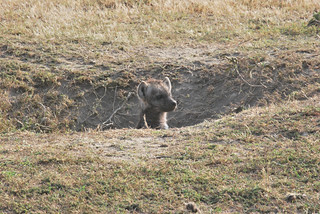 The last animal we saw on the day we were leaving the crater was the baboon on the right. 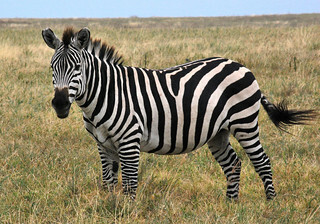 Linda's favorite safari animal is the zebra. We took lots of pictures. And, why not. 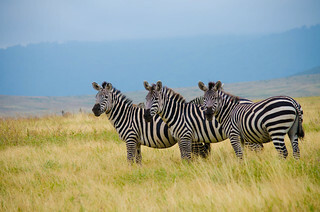 There were lots of zebras. We have them as individuals. And in small groups. That is our group of three on the left and Kristian's group on the right. How does Kristian do it? We have them with a tree and we have them with water. They might just be the most cooperative photo subjects that we encountered. Now, on to the antelopes and gazelles. 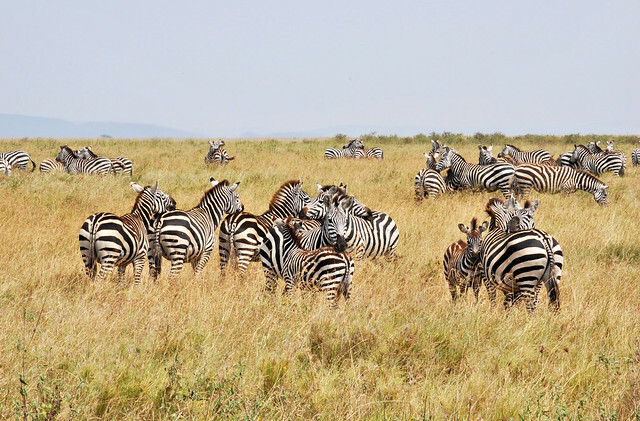 When Hemingway wrote Green Hills of Africa in the mid-1930s, he mentioned a dozen different types of antelope by my count: Bushbuck, Eland, Gerenuk, Grant's Gazelle, Impala, Kongoni, Kudu, Kudu(Lesser), Oryx, Reedbuck, Sable and Waterbuck. 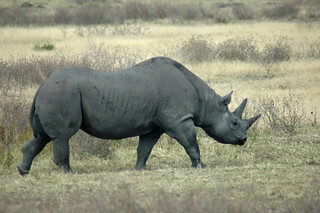 The book is primarily focused on Ernest's quest for a trophy Kudu. 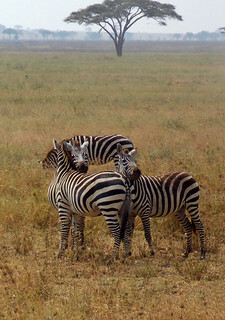 It might be useful for us, now, to pause and look more generally at what are called antelope. 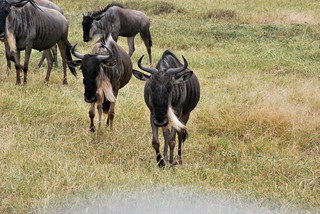 'Antelope' is a catch-all term for bovids (members of the family Bovidae, which includes cattle, sheep, goats and so on) with long, slender limbs. 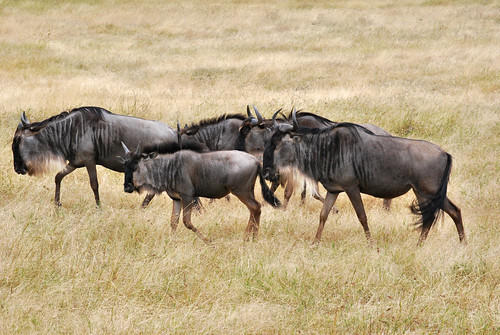 For example, wildebeest, topi, impala, oryx, nilgai, eland and kudu are all antelopes. 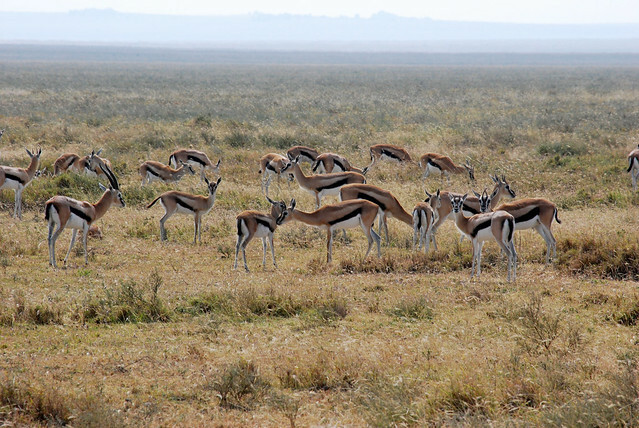 'Gazelle' is basically just the name we give to small antelopes, and again there are many species, including the Thomson's gazelle, Grant's gazelle, springbok and gerenuk. 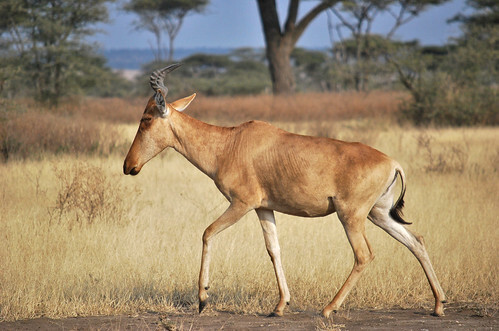 Let's start with a Hartebeest. Their antlers make them easily identified. 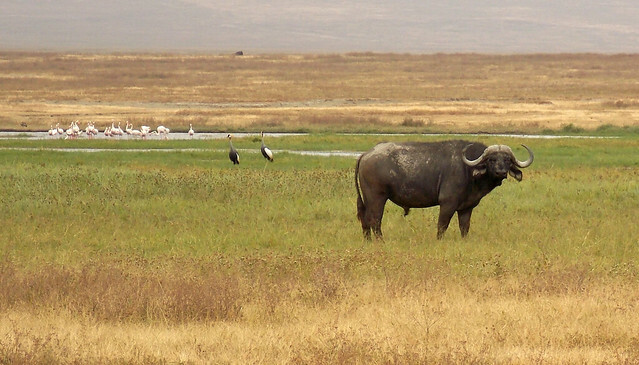 Is this a Hartebeest too? I'd say, "yes," in a heartbeat. 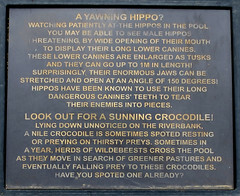 Which reminds me that sometimes we were told the name of an animal but it was difficult for some people to understand precisely until the driver passed around his guidebook. 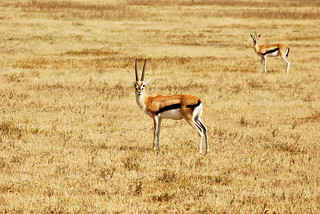 Grant's Gazelle and Thomson's Gazelle were found throughout the area. Thomson's has the black stripe on its side as a distinguishing characteristic. 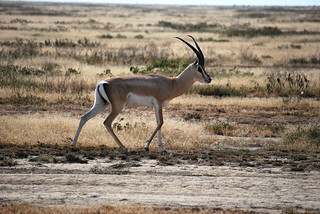 The Thomson's Gazelle was encountered much more frequently and in larger numbers. 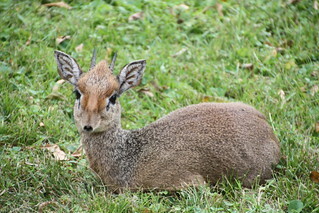 The smallest of the small antelopes is the Dik-dik. 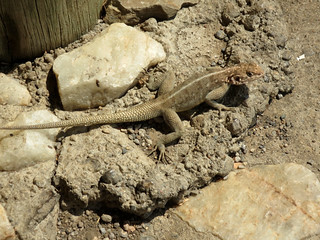 They are almost pet-sized and we saw them on the grounds of at least one restaurant as well as out in the open. 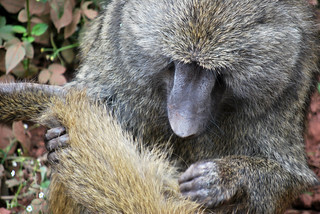 The photo on the right comes from Melissa, another of our group's photographers. 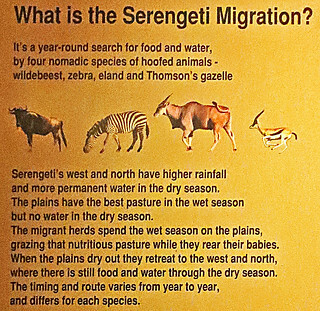 We also saw at least one Impala and perhaps some Oryx and Eland. But, alas, no Kudu. So, from one point of view, the Safari was a failure. But a very interesting failure, nonetheless. 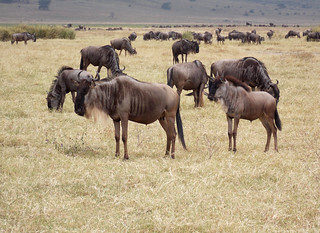 What about Wildebeest? 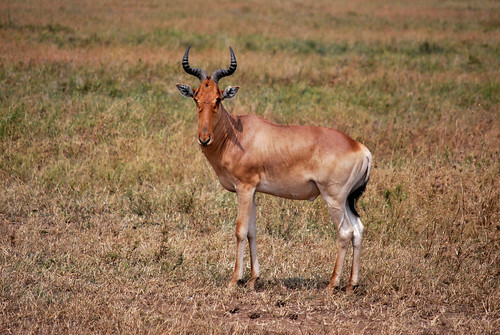 In spite of its classification as an antelope, it almost never is mentioned as one of them. And, with good reason. 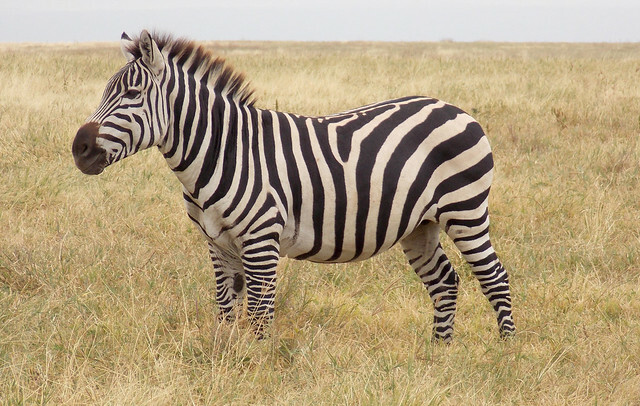 It just doesn't look very antelope-y. We encountered them in great numbers. 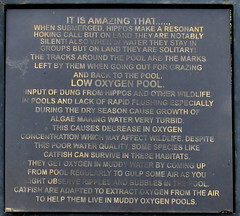 These are in the bottom of the crater so have no need to follow the spring migration. 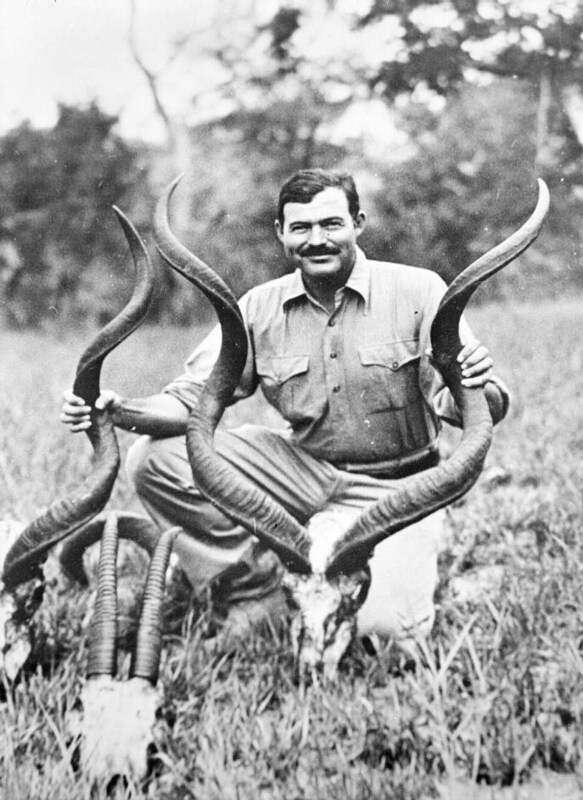 Hemingway's Green Hills of Africa is the story of his personal hunting trip focused largely on his quest to take a trophy Kudu. 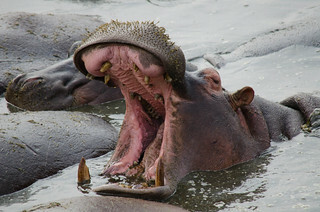 As readers, we are held in suspense through much of the book as Hemingway and his guides seek out this beast. Naturally, the animal that I most wanted to see in Tanzania was the Kudu. 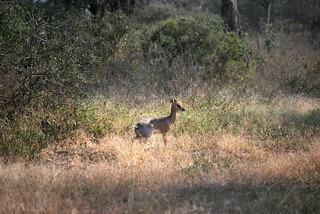 Did I see a Kudu? Sadly, no. So in that regard I have to pronounce the journey a failure. But it was very rewarding in all other aspects. So, you may ask, "Did Ernest get his trophy Kudu?" Even if you are not a Hemingway fan (I find it hard to believe that more than a very few people fall into this category.) 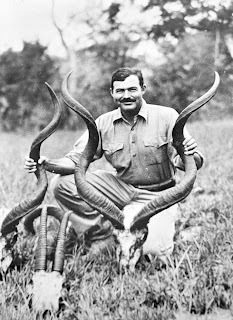 and are of a certain age, you will likely recall this photo of Hemingway with Kudu antlers. But was it truly a trophy Kudu? You'll have to read the book to find out. 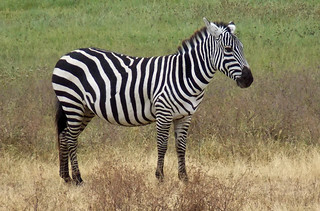 And was Green Hills of Africa really about Hemingway shooting animals or was it about shooting at his critics and competitors? For the answer to that, you will have to read a great deal more about the man. If you are not "of a certain age," both reading Hemingway and reading about Hemingway might be an eye-opener. If you happen to be a fan of either Big Government or "modern" medicine, reading about the FBI's tracking of Hemingway or the impact on him of electroshock therapy may build a bit of skepticism. A. E. Hotchner's early personal memoir, Papa Hemingway, remains the best guide to Ernest's descent into despair at the hands of the doctors at Mayo Clinic. Let's continue with the cats. 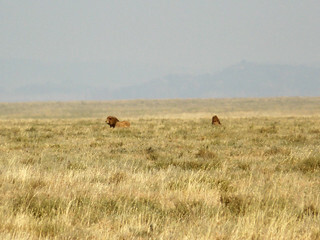 Male lions are a bit harder to find than the females. 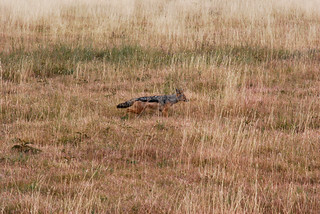 We ran across these two who were quite a distance from the road. Other groups had a closer view. Once again, credit Kristian with getting the perfect picture. 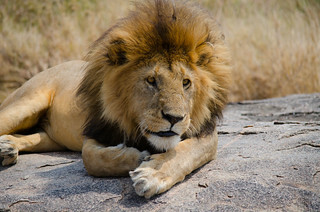 Other cats were seen even less frequently. 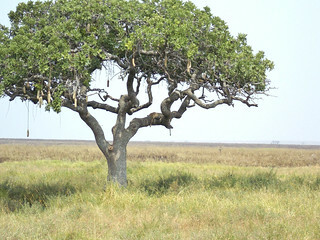 Here, our group sees a Leopard that is resting in a tree. 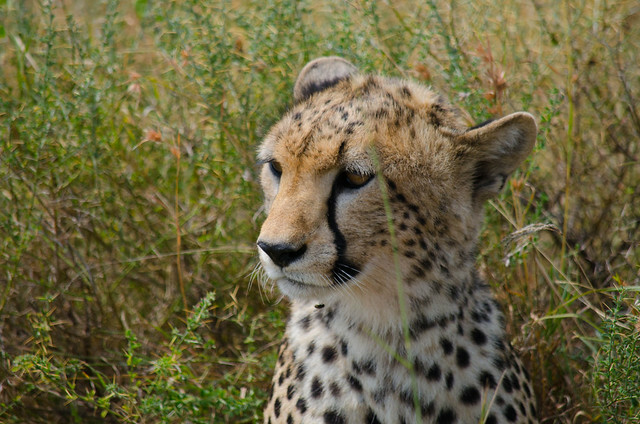 Meanwhile, one of our other vehicles came upon a much closer Cheetah. And again, Kristian gets the picture for us. 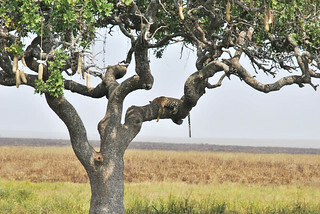 If you are wondering how to tell a Leopard from a Cheetah, see this web page. Short answer - those black "tear lines" that run from the corner of their eyes down the sides of their nose to their mouth mean it's a Cheetah. 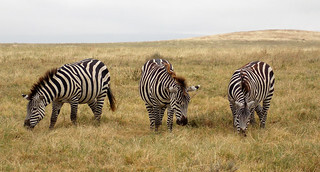 Two more large animals made their appearance for us on the floor of the Ngorongoro Crater. 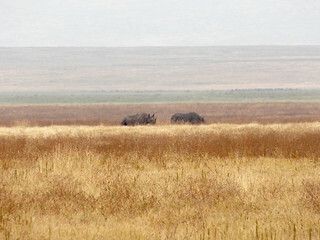 Our vehicle spent at least an hour looking for and at these Rhinoceroses, pictured on the left. I suspect that we were never closer than a quarter mile. Another of our vehicles found one crossing the road. This time we have to credit Corky with getting the picture for us. 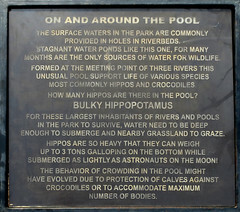 The other large animal found in the crater is the Hippopotamus. We saw them in several places. 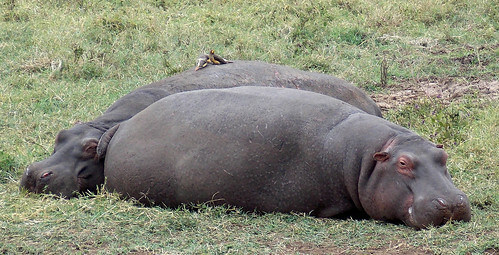 They probably look the cutest lying on the ground. Well, maybe cute is not the right word. 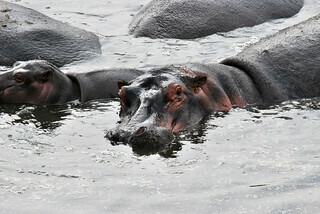 We also encountered them in a pool. 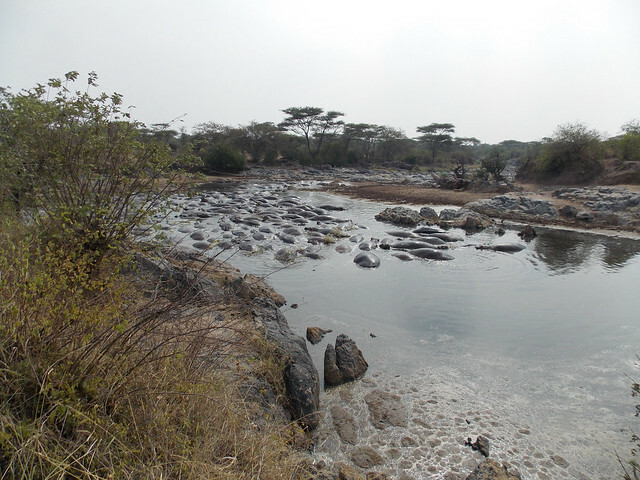 What, at first glance, looks like rocks in the river is actually a large number of hippos. To anyone who has spent time around a hog barn, the smell of this pool was quite familiar. To many in our group it just smelled B-A-D! A nice set of signs described the environment. I took the picture on the left. Once again, Kristian demonstrates his artistic talent and patience by waiting for that "Kodak Moment" and got the picture on the right. 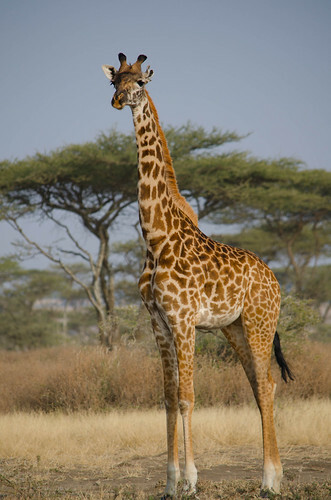 Now that we have looked at the "big"animals, what about "tall." 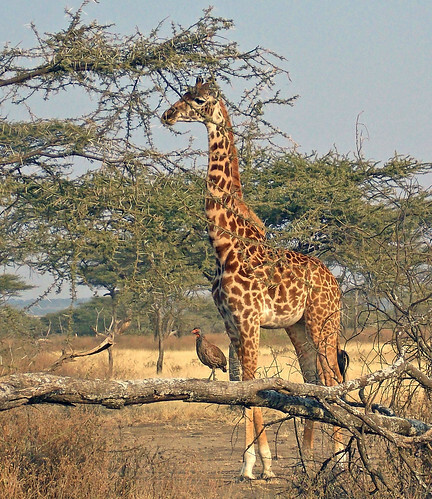 We saw many giraffes. Kristian gets credit for finding one not in the trees and bushes. They seem to be constantly eating with their heads down. 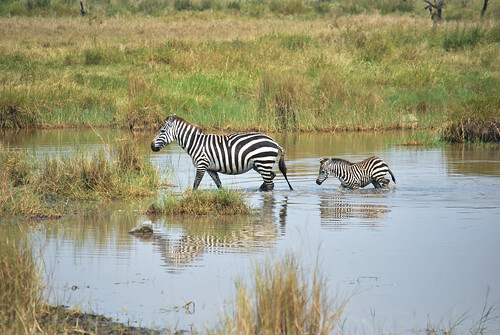 Tanzania - We're on Safari! 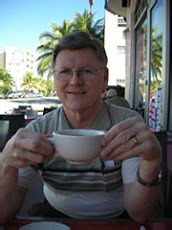 What's the Price of Gasoline in Tanzania?